Are they one and the same thing? Author of "Making It in IT"
Part 1 of this blog dealt briefly with the differences between CS and IT in their applicability to computing needs in today's workplace. This was the reason I developed a list of topic names, which represent the modern IT, for comparison with practically any CS course curriculum worldwide. This I expanded into a Glossary, aimed at introducing topics and indicating where simple further reading can be found, aiming it much more than a simple expansion of acronyms or 1-line description. Thus, I feel it is useful as a learning tool and a reference document. Bimodal IT is the state where organizations need two speeds of IT — often called traditional IT (business as usual) and agile IT (Gartner calls them mode-1 and mode-2). Traditional IT is focused on "doing IT right", with a strong emphasis on efficiency and safety, approval-based governance and price-for-performance. Agile IT is focused on accelerated development and implementation, supporting prototyping and iterative development, rapid delivery, continuous and process-based methodology. Its role is to support and add value to business initiatives to generate value and/or revenue earlier that would otherwise be the case. Sometimes used in place of BCM although some people may interpret them differently. In essence they both mean "keeping the business show on the road" when disaster strikes the IT setup and is much broader than IT disaster recovery. It includes, for example, temporary premises for displaced staff, transport activities and other non-IT considerations after the event. "Converged infrastructure, sometimes known as converged architecture, is an approach to data centre management that packages compute, networking, servers, storage and virtualization tools on a prequalified turnkey appliance. Converged systems include a toolkit of management software." Converged infrastructure is an approach to data centre management that seeks to minimize compatibility issues between servers, storage systems and network devices while also reducing costs for cabling, cooling, power and floor space. A converged infrastructure can be implemented with a CI reference architecture, with standalone appliances or with a software driven hyper-converged approach. A CI is the IT equivalent of an off-the-peg suit from a tailor, that is, a premade suit but not made to measure for a particular person. It is unlikely that the vendor will supply such a ready-made suit with a 50 in. chest coat and trousers of 22 in. length, unless there is big demand for such a very odd requirement or he wants to go out of business. Vendor longevity and trustworthiness are required here. DevOps is a term emerged from the combination of Development and Operations. The role of a DevOps engineer is to automate all the operational work in the way that a developer would do. The idea is to encourage frequent releases to increase quality and get early feedback. See the entries "continuous delivery" and "continuous testing" (q.v.). DevOps is not a technology but a way of doing things, or methodology, according to Webtorials. "Hence, according to me [author of the article below; Nilesh Kanawade], the main two objectives of DevOps are increasing the speed and quality of the deliveries." There are lots of encryption algorithms and NIST has approved some of them: Advanced Encryption Standard (AES), TripleDES, and Skipjack. On the asymmetric side, approved algorithms are DSA, RSA and ECDSA [NIST, 2013]. One key point about erase coding is its ability to recover from corrupted storage faster than RAID configurations, especially involving very large data sets (databases etc.) and storage volumes. Although not a totally new concept, IBN has been pushed by Cisco as a way forward in function-effective and cost-effective networking. It is a subset of automated or even autonomic (q.v.) computing where intelligence is used to monitor and manage resources. There are also articles by Cisco and Gartner, the latter with risk and other cautionary factors about IBN. 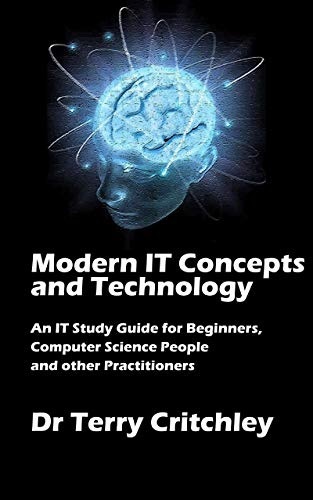 I hope I have made my "CS is not IT" point without malice and introduced the discerning reader to a source on information on "modern computing" aka "workplace IT." Until this nettle is grasped, bodies will continue to imagine that boosting CS teaching will solve the IT Skills shortage. It will not. The UK Government has recently shelled out £ 100 m. to increase the UK "digital skills" … to academia, in the form of five Universities' CS faculties! I have asked each one of the five what their planned topics are and received one reply – they are doing 2 very specific, very narrow topics which I believe will solve little of the problem. Purchase Dr. Terry Critchley's Book: "The IT Glossary: Information Technology Concepts and Topics Defined and Explained"